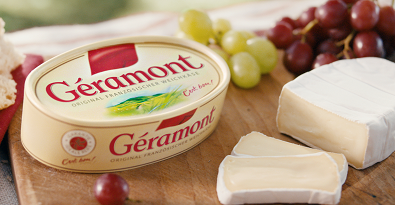 With its mild and creamy flavour, Géramont has been a favourite with German consumers for over 40 years. Synonymous with pleasure and the French way of life, over the years it has become the most popular French cheese in Germany. forests of the Vosges region. today by the expertise of Master Cheesemakers. the quality of its maturation. In Germany, Géramont offers a variety of cheeses to suit all tastes and all occasions: aromatised and light versions, slices, creams, snacks and minis. The brand is inseparable from its long-running advertising campaign and its slogan in French “Géramont, c’est bon, c’est bon”. With the benefit of 90% awareness, Géramont is the leading cheese brand on the German market. Over 8 million German households buy it each year. Unique and authentic, Saint Agur is a veined blue cheese made strictly according to cheese-making expertise. With its unique octagonal shape, this is a cheese with character: strong and melting for the peak of pleasure.